Premier Auto Trade has introduced the new PlusQuip Fuel Injector Service Components line to complement their range of over 180 direct fit fuel injectors. 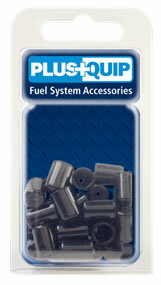 The new range includes over 170 part numbers as well as a Fuel Injector Repair kit in a robust storage and carry case. Both “ top feed” and” side feed “ EFI Injectors require quality service and repair components to ensure correct fuel flow through the injectors, and for safety reasons the long term continuous sealing of fuel under pressure through a range of extreme temperatures and operating conditions. For this reason new seals must be fitted whenever an injector is removed from its sealing surface. The renewal of any “buffer” rubbers is also required to ensure the correct seating and location of the injector. 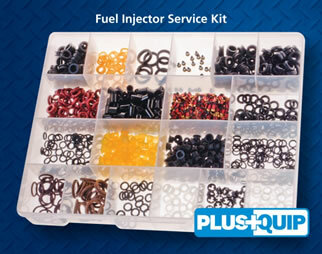 The PlusQuip Fuel Injector Repair Components Kit includes the most common components required to rebuild leading brand fuel injectors. The kit includes buffer seals, body seals, filters, space washers, pintle caps, lower seals, as well as upper and lower O-rings. Buffer seals suitable for Denso, Bosch, Aisan, Hitachi, JECS, SARD injectors. Body Seals for Bosch, Denso and JECS injectors. These new product offerings are distributed in Australia by Premier Auto Trade, and are available to the trade through a network of specialised resellers and leading automotive retail groups.